650 people have attended the conference at Corum (Montpellier) on June 20 titled "Neither State Nor Market: Community Organization of Resources". Voici un module Flickr utilisant des éléments d'un album intitulé Elinor Ostrom en visite en France. Créez votre propre module ici. The whole works and exchanges of June 21, 2011 between researchers/PhDs and Elinor Ostrom will be published in scientific journals at the end of the year 2011. Agropolis International, CIRAD, Montpellier 1 University, CNAM and UNESCO have been in charge of this event. Elinor Ostrom has been invited to France in homage to her overall work. She was in France from 20th to 24th June 2011 and has participated in a series of events in Montpellier and in Paris. 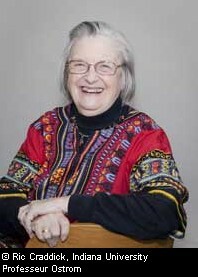 E.Ostrom's works are one of the main reference for those who, in the scientific and politic worlds, are building their speeches and actions on the one hand only on state management, and on the other hand, on the promotion of private property as a universal tool for the management of resources and environment management. E. Ostrom's analysis presents the collective action and the auto-organization as a third alternative between privatization and state management. Elinor Ostrom is Professor of Political Science at the Indiana University Bloomington (USA) where she has created the Workshop in Political Theory and Policy Analysis with her husband, Vincent Ostrom. She is also the Director of the Center for the Study of Institutional Diversity at Arizona State University (USA). In 2009 she became the first woman to receive the Nobel Prize for Economics, with Oliver Williamson, for her analysis of economic governance and, in particular, common goods. To see a video of her speech on this occasion, click on the link below. 08h45 – 12h: « School-researcher : "Collective Action: Epistemology, Theory, Methodology"
Conference "People and water: agriculture, environment and Mediterranean zone"